One of the best college acapella choirs in the world will be in concert at Gloria Dei, Saturday, April 20, 2019, 7pm. Sunday, April 28, 2019, 2:30pm – 4:00pm. ORGAN CONCERT WITH JAZZ PERCUSSION! Dr. Hwang will team up with Tsugumi Shikano for a unique event for organ and percussion. Admission is free; donations will be welcomed. Contemporary Christian singer and songwriter Arvid Petterson will be in concert in the Sanctuary, Wednesday, January 30, 2019, 7pm. For more information and to go to Arvid’s website, click here. 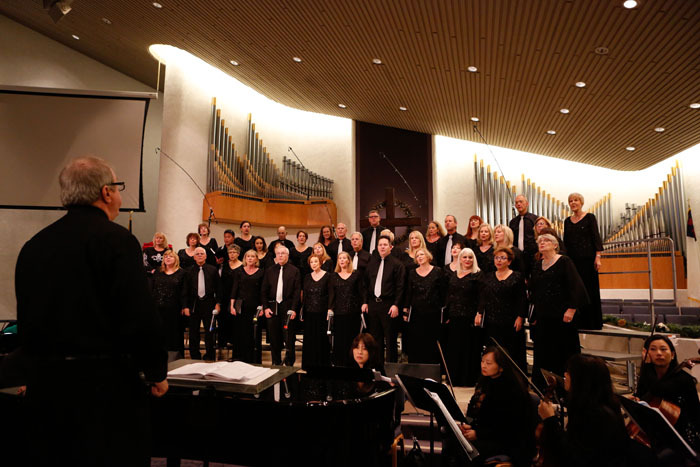 SAN CLEMENTE CHORAL SOCIETY CONCERT: Presents Joy to the World – A Global Holiday Concert on December 8, 3pm. Tickets are $15. SOUTH COAST SINGERS: Presents Holly Jolly Holidays Concert on December 14, 7pm. Tickets available at 949-613-7840 or ww.southcoastsingers.org. Prices vary $10-20, depending upon age. Under 6, free. Organist Hanna Lee, a native of Seoul, Korea, received her Doctor of Musical Arts degree from the University of Iowa studying with Delbert Disselhorst and Delores Bruch. Her Doctoral thesis explored the works of contemporary French composer, Naji Hakim, and his musical language and extra musical association in his pieces. She holds degrees of Bachelor of Arts and Master of Music degrees in Organ Performance at Yonsei University in Seoul studying with Myoung-Ja Cho. She completed Graduate Certificate in Organ Performance at Northwestern University in Evanston, Illinois where she studied with Wolfgang Rübsam. She studied with Piet Kee and Ewald Kooiman focusing on organ music of J. S. Bach and North German School in Netherland. Currently, Hanna Lee is a faculty member of Jeongdong Organ Academy in Seoul, Korea. This concert is sponsored by Gloria Dei Lutheran Church and the Los Angeles Organ Company to celebrate Gloria Dei’s new three manual organ. Harpsichordist JungHae Kim’s playing has been described as “gallant and regal” (La Folia), “supple…impressive” (New York Arts), emotionally exquisite, warm, and inviting. Ms. Kim holds a Bachelor’s Degree in Harpsichord Performance from Peabody Conservatory, and a Master’s Degree in Historical Performance (Harpsichord) from Oberlin Conservatory. She completed her studies with Gustav Leonhardt in Amsterdam on a Haskell Scholarship, and holds an Advanced Degree in Harpsichord Performance from Amsterdam’s Sweelinck Conservatorium. Ms. Kim has performed in concert throughout United States, Europe and in Asia as a soloist and with numerous fine historical instrument ensembles including American Baroque, Brandywine Baroque, Callisto, Musica Angelica, Musica Glorifica, Music’s ReCreation, and Ensemble Mirable. Kangwon Lee Kim is a versatile violinist with repertoire ranging from baroque to 21st century using both baroque and modern violins. She has given recitals throughout the U.S. and in Korea, Canada, Puerto Rico, Switzerland, Norway and Czech Republic, and the live recording of her performances have been heard on National Public Radio, WFLN in Philadelphia, and Wisconsin Public Radio. Ms. Kim was Assistant Professor in violin and chamber music at Biola University in CA and has also taught at Ripon College, the University of Pennsylvania, and Lawrence University Conservatory. Currently, she is the Assistant Artistic Director and concertmaster of Madison Bach Musicians and often plays solo and leads the ensemble. During the summer, Ms. Kim teaches at Credo summer chamber music festival at Oberlin College. Ms. Kim lives in Middleton, WI with her husband and two sons and keeps an active teaching and performing schedule.